Do you have what it takes? Do you have the heart of a champion? Do you want a free trip to Las Vegas in October to attend the 2015 Tableau Conference and compete in grueling battle for viz supremacy? Of course you do! That’s why you should enter our Iron Viz contest! This is the last feeder contest of the year for the championship, so it’s your last chance! There’s a whole lot you can do with music data, but finding it is difficult. I’ve rounded up a couple datasets for you if you don’t know where to look. Pitchfork is an authority on indie music and beyond. They’ve been around since 1995 and their website lists reviews going back to 2000. I used import.io to scrape their site and get you this dataset of their reviews. The dataset contains the artist, album, reviewer, review date, score, and links. Get it here. Glee was a musical phenomenon that took the media by storm. The show covered hundreds of songs during its 6 year run. I combined a couple different Wikipedia tables to create this dataset of songs performed on Glee. It has the song, original artist, genre, episode, and even some estimates of how many viewers tuned in to see them perform that song. Get it here. I’ve been a data+music nerd for a long time. If you need evidence of that, just check out how my Last.fm data goes back to August 2006. This is a real simple dataset, containing only artist, album, track, and date listened. It’ll take some interesting calculations and perhaps blending in other data to make something really cool. But, nearly 9 years of my changing taste could have some stories buried in there. Just promise not to make fun of my emo phase. Get my data here. If you are a Last.fm user and want to analyze your own data, check out this handy tool to download it as a CSV. In response to Joel Whitburn’s massive cataloging of every charting U.S. single, a group of internet music enthusiasts have created a UK version. You can download a spreadsheet with the data here. This one isn’t in an easy spreadsheet or text format, but if you’ve got the patience to figure out how to open it, the Million Song Dataset contains a wealth of metadata about one million popular songs. Find it here. Discogs: A database of information about record releases and a marketplace for used vinyl. Includes lots of details about when certain editions of vinyl were pressed. Jambase: This is the website I scraped in order to get information about festivals for my blog post for Travel month. This is a great resource if you want to make a viz about live music. Allmusic.com: This is one of the most comprehensive music databases out there, listing artists’ genres, styles, and an interesting section that I think has a lot of potential: moods. Are those wheels in your head turning? Have you got an idea for a great music themed viz? Great! Head on over to our Contest Page for more information about the contest, or check out the contest FAQs. When you are ready to submit just fill out the form! Good luck and good viz! 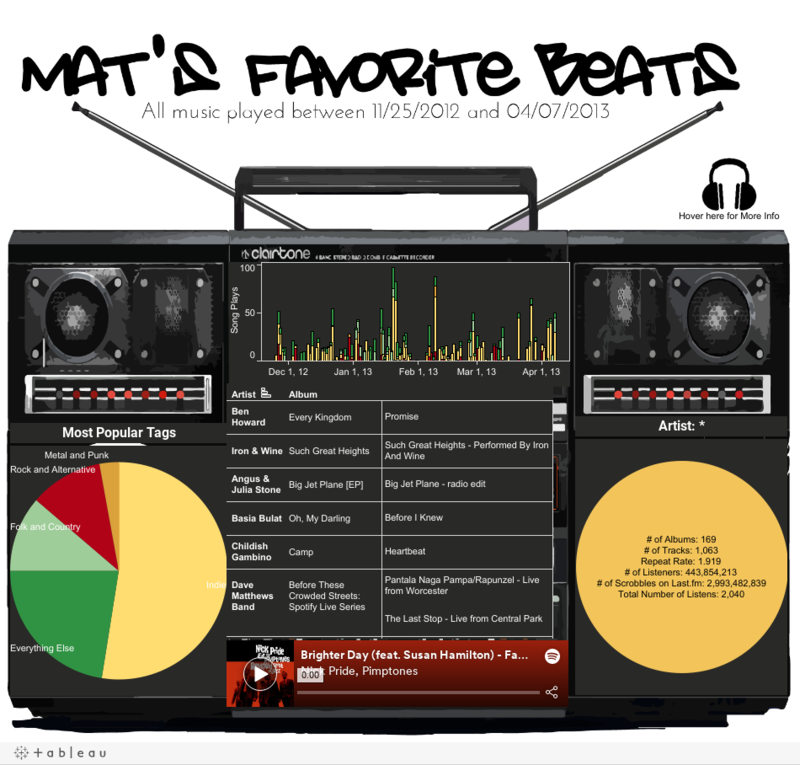 Enter the Music Viz Contest!